Mark Ruffalo was ruffled when Jimmy Fallon began strapping him to a lie detector machine on The Tonight Show With Jimmy Fallon. And perhaps rightly so, given his track record. The Hulk actor has previously dropped a monstrously huge – albeit missed by many – spoiler about the shocking ending of Avengers: Infinity War. Speaking with Good Morning America at the 2017 Disney D23 Expo, Ruffalo announced ‘In this next one, ha — everybody dies!’, catching himself awkwardly before saying ‘half’. Ruffalo is not exactly the sort of person you’d want to plan a surprise birthday with, and no doubt the rest of the cast felt more than a little on edge letting Ruffalo roam free among interviewers in the final run up to End Game’s release. And when that lie detector test was wheeled out, directors Anthony and Joe Russo no doubt felt their hearts drop. The lie detector went haywire on a few very telling occasions, suggesting Ruffalo was holding back or lying about certain things concerning the upcoming superhero film. The tell-tale needle went ballistic when Fallon asked whether or not there were any spoilers in the trailer, and again when Fallon pressed him about whether Hulk and Black Widow would finally get together. Is the Hulk really a shape-shifting alien known as a skrull? Is everyone who disappeared during the snap from Thanos actually gone? Or is there any way that they can come back? At this point, our tea spilling superhero had endured quite enough, snapping his fingers Thanos style before getting the hell out of the studio. 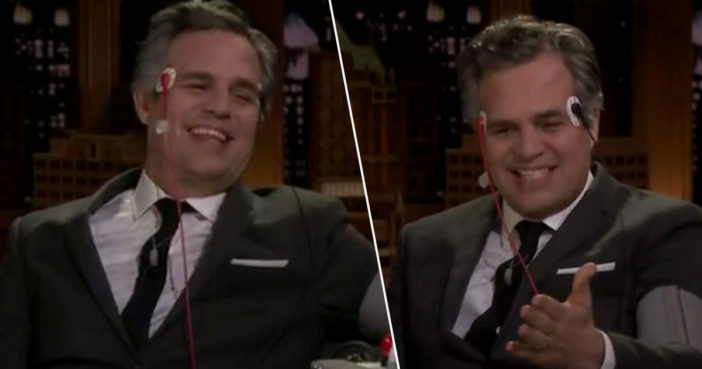 Just watch Mark Ruffalo on Jimmy Kimmel… its hilarious 😂 especially the lie detector test..
You can watch Avengers: Endgame in cinemas from April 26 onwards.